This is yet another of those "I just had to share...." moments. 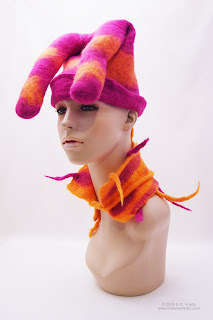 I've decided to start experimenting with costume design and more extreme felted wool fashions. 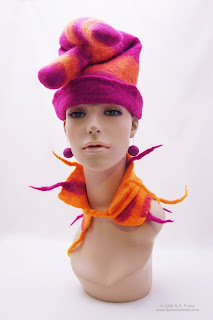 Since the pieces are mainly wet felted with corriedale wool and seamless, it is a challenge for me to figure out how to make the shapes that I want and mold them into the finished pieces. It is a fun, fun challenge that is! This court jester or joker costume is my first attempt at making a complete set. Although it is certainly strange, I really like the way it turned out. I'd love to eventually do some theater costume design, but that may be a long way off if ever so for now I'll keep experimenting. I have an idea for another jester costume set so be on the lookout! It's fantastic!! Girl, you are putting the FUN in Funky!! That is really cool. I love the colours. Oh wow, so much work! They are fantastic! OK, it's gorgeously colorful, but that disembodies head is giving me chills.